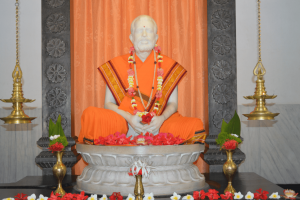 Sri Ramakrishna is regarded as the Avatar of the modern age by millions of people around the world. 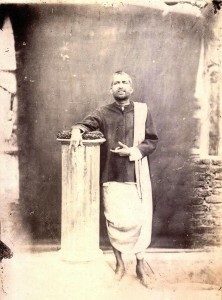 Born on 18 February 1836 in Kamarpukur, a village about 120 kilometres to the northwest of Kolkata, Sri Ramakrishna had only the rudiments of school education. At a young age, owing to poverty at home, he became the priest of the Kali temple at Dakshineswar, newly built by Rani Rasmani. He could not continue his priestly duties for long, as he absorbed himself in his spiritual disciplines. Possessed as he was by intense longing for God from his childhood, Sri Ramakrishna plunged into intense spiritual practices. After attaining the realization of God as the Divine Mother of the Universe, Kali, he followed the spiritual paths of different sects of Hinduism and the spiritual paths of other religions like Islam and Christianity, and realized the Ultimate Reality through them all. His spotless holiness, utter simplicity, extraordinary spiritual wisdom and love of God drew people to him like a magnet, and a number of sincere seekers gathered around him as his disciples. God realization is the ultimate goal of human life as that alone can bring man supreme happiness and peace. God is one, and is known by different names in different religions and sects. God can be realized through various paths taught in world religions. All religions are true in so far as they lead to the realization of the Ultimate Truth. God dwells in all people and so everyone, without the distinction of caste, creed or race, should be treated with respect and served with love. Sri Ramakrishna trained a group of young men, the chief of whom was Narendra, to carry on his mission of spiritualizing the human race all over the glove. After the passing away of Sri Ramakrishna on August 16 1886, this group of sixteen young men under the leadership of Narendra took the vows of Sannyasa and formed a monastic brotherhood, which came to be known as Ramakrishna Math. “This is the message of Sri Ramakrishna to the modern world. Do not care for doctrines, do not care for dogmas or sects or churches or temples; they count for little compared with the essence of existence in each man, which is spirituality. The more this is developed in a man, the more powerful is he for good. Earn that first, acquire that, and criticize no one, for all doctrines and creeds have some good in them. Show by your lives that religion does not mean words, names, or sects, but that it means spiritual realization. Only those can understand who have felt. Only those who have attained to spirituality can communicate it to others, can be great teachers of humanity. They alone are the owners of light. On God and His Existence: “You see many stars at night in the sky, but find them not when the sun rises; can you say that there are no stars in the heaven of day? So, O man, because you do not behold God in the days of your ignorance, say not that there is no God”. On God’s nature: “It is the nature of the lamp to give light. With its help some may cook food, some may forge deeds, and some may read the Bhagavata (scriptures). Is it the fault of the light? So, is it the fault of God that some try to attain salvation with the help of His holy name, while others use His name for success in attempted theft? On how to harmonize the world and God: “As a man standing on the brink of a deep well is always watchful and afraid lest he should fall into it, so should a man living in the world be always on his guard against temptation. He who has once fallen into that well can hardly come out of it pure and stainless”. On the practice of non-attachment: “The maid-servant says with reference to the master’s house, ‘This is our house’. All the while she knows that the house is not her own, for hers is far away in some distant village of Burdwan or Nadia. Her own thoughts are all sent forth to her village home. Again referring to her master’s child in her arms she will say ‘My Hari (that being the name of the child) has grown very naughty’ or, ‘My Hari likes to eat this or that’ and so on. But all the while she knows certainly that this Hari is not her own. I tell those, that come to me, to lead a life unattached like this maid-servant. I tell them to live unattached to this world – to be in the world, but not of it- and at the same time to keep their minds directed to God – the heavenly Home from where all come. I tell them thus to pray for Bhakti, and found their lives on it”. On spiritual practice: “The human mind is like a pack of mustard seeds. As it is very difficult to gather the seeds that escape out of a torn package and are scattered in all directions, so when the human mind runs in diverse directions and is occupied with many worldly things, it is not a very easy task to collect and concentrate it. The mind of a youth, not running in diverse directions, can be easily fixed on anything, but the mind of an old man being totally occupied with worldly things, it is very hard for him to draw it away from them and fix it on God”.